Forget-Me-Not plants are 15-25cm tall mounding plants which are charming when massed, edging borders, or covering spring blooming bulbs such as tulips, daffodils or hyacinths. 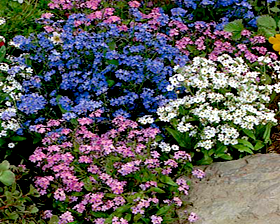 Compact, rounded mounds, covered with bright, cheery, blue, rose-pink, and white blooms with contrasting yellow eyes. Biennial. Winter hardy. Sow seed in cell packs or flats, press into soil but do not cover. Kept at 18C, germination is in 10-20 days. Can direct sow into prepared seed beds (barely cover) when a light frost is still possible.